“I would like to say that ur professonal service and price is SECOND TO NONE !!! . Your Son was very undrstanding to our needs and issues we had , not to mention your on call service is spot on. l”ll spread the word to others also. “Thank you for INCREDIBLY FAST service. My well pump stopped working, called R&G and WITHIN 1 hr Rick and his partner were at my house to diagnose the problem. They diagnosed the problem, (bad well pump), had a new one on the truck and within the next hour they pulled my old pump, checked all the connections and installed the new well pump. I NEVER THOUGHT they could be that efficient to get my water working!!! 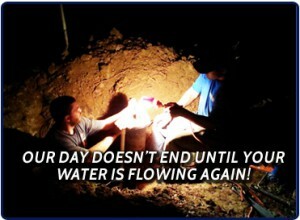 It was a painless experience so don’t be foolish wasting time, call R&G for ALL your water issues! “R & G came to my home to work on my Culligan System. 1. Arrived on time and when he introduced himself made it a point to assure me that his truck did not leak oil. 2. Had all the materials he needed to complete the job and they were wrapped in their new casings. 3. Knew exactly what needed to be done and he was fully aware as to how to complete the work. 4. Made it his priority to inform me every step of the way of what he was doing. 5. Made sure to answer any and all of my questions and concerns I might have had.